Yes, my challenges for weeks 6 and 7 are out of order. I was out of town for a few days in the last week which put me behind and, apparently, into a confused state! Nevertheless, here is my submission for online research databases available through our local library. The number of databases available through my library system is significant. From Arts and Entertainment to Science with that most wonderful subject of Genealogy right in the middle! I regularly use the Heritage Quest census, Digital Sanborn maps and World Atlas features. All genealogists will agree those are fantastic tools to be able to access from home. My favorite resource, however, is the Historical New York Times database. My father's Baudermann family is from New Jersey. While I wasn't sure if I would find anything of value on that family in the New York Times I, of course, put their name in the search box. I got 31 hits, what a surprise! I found through the newspapers, that my grandfather attended and graduated from NYU in 1908. 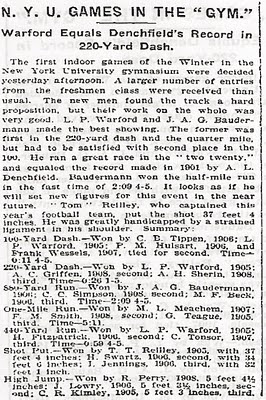 He was also on the track team, as the clipping shows. He was a pretty fast guy, story after story listed him as the winner usually of the longer distance events. As hard as it has been to find information on him, I hit the jackpot on his college years. I have come to rely on the online databases available through the library system. What a convenient way to work on genealogy research.